We’re done! 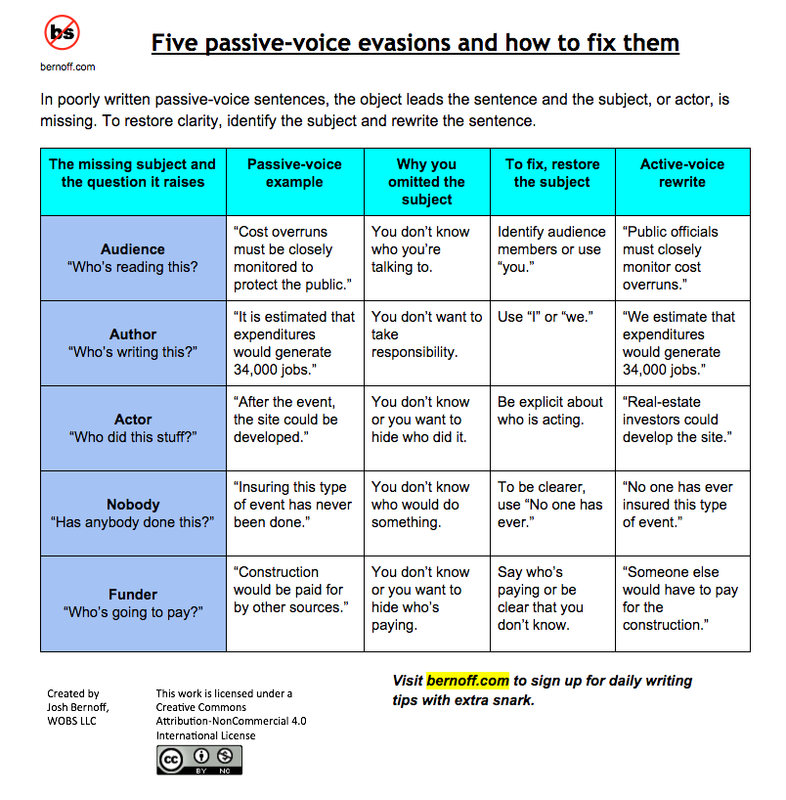 It’s the final installment of “5 passive-voice evasions and how to fix them,” by Josh Bernoff. #5: Who is going to pay? This economic analysis [KC – The city of Boston’s bid for the 2024 Olympics] is rife with passive statements that obscure where the money is coming from. · Of this $3.7 billion [spent in Massachusetts], we estimate that $2.9 billion would be funded with money from outside of Massachusetts, thus representing a gain to the Commonwealth. · [Local Olympic Committee] revenue sources cannot be used to construct permanent or legacy projects for a region. Permanent construction associated with the Olympic Games would be paid for using other funding sources. How to fix: Explain who will pay, or that you don’t know who will pay. · Visitors from outside Massachusetts will spend $2.9 billion of the $3.7 billion spent here. · Somebody other than Boston 2024 will have to fund the permanent construction. And below is a great chart to remind you of the lessons from the past few days. By the way, if you choose to sign up for his blog, remember that his web address and emails contain a swear word, represented by the symbol on the upper left of his chart below. Consider yourself warned.